Just a few days ago we were presenting software for one of the most popular mainstream Linux distribution – Ubuntu. Now let’s cover the progenitor of all free and open-source software. Its operating system was released on October 5, 1991. The creator of Linux, Linus Torvalds, was only 22 years old at that time! Linux is not very popular on the desktop computers (at least among regular users, software engineers, for example, prefer to work on it), but it is the leading operating system on servers, mainframe computers, and virtually all fastest supercomputers. It is also worth mentioning that without Linux there won’t be no Android as we know it now, no network routers, video game consoles, and smartwatches. We really owe a lot to Mr. Linus. According to Wikipedia, the development of Linux is one of the most prominent examples of free and open-source software collaboration. Its source code may be used, modified and distributed—commercially or non-commercially—by anyone under the terms of its respective licenses. Thanks to it we can use some great software like the already mentioned Ubuntu, but also Fedora, Gentoo Linux, Debian and more. Okay, that’s enough about Linux, let’s get to the topic of this post – a presentation of time tracking software designed for this system. 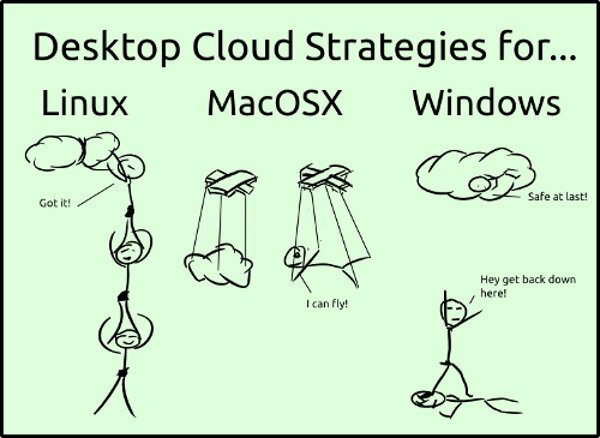 As it is not so popular as Windows or Mac OS, there are many of them but we have done some research and found a few pearls. Tracking holidays, days off, etc. It is a simple and intuitive time tracking app, it doesn’t take much time to get familiar with all of its features. We write the tag of the project and click the START button. Once we change the activity, Hamster will stop tracking it. However, we have to add the new one manually – which is one of its flaws. Overall, this is a great tool and as it is designed strictly for Linux, we can expect constant updates. Hopefully, the makers will automatize it a little more and make it nicer to the eye, especially the display of the tracked time. Hubstaff covers every major Linux distribution and also offers cross-platform solutions. Basically, it shouldn’t make a difference what operating system the workers use, they should still be able to work together. Every time a new upgrade for Linux is introduced, Hubstaff releases patches and updates to make sure that the software is secured. Perhaps not everyone can be comfortable with the fact that now and then Hubstaff is taking screenshots of our desktop. To tell the truth, this is how most of the time trackers work. We can work on the free version, but if that is not sufficient enough, there are a few paid plans we can choose from. If we are not ready to make a purchase, trying the free version is still recommended, as it is a well-developed time tracking software. Looking for a time tracking alternative? Check TimeCamp vs Hubstaff comparison! Though Klok producers were aiming for Windows, they designed Klok as an adobe air application. It just so happens that most of Linux distributions support Air – all we have to do is to check whether we got the version that does so. Klok is a decent time tracking tool with a number of features – colorful charts with reliable and detailed information on the time tracked throughout the day, automatic time tracking with the adjust feature, invoice generator or dashboard reporting to name just a few. It does, however, have some weaknesses. There are many reports about bugs and glitches (especially in the Linux environment). The cloud storage is not offered, the data is stored on the user’s computer and cannot by synchronized between different ones. What is more, most Linux users agree that Klok, as it is running on Adobe Air, is not a “true” Linux program. It may be a tool worth trying if you are a freelancer – a free version is being offered, though it has some very basic features. If you are a manager, well, we recommend something more advanced. See the differences between Klok and TimeCamp! It is a web-based software that tracks and classifies time. Thanks to it we have an access to our timesheets and can print them – from daily ones to yearly, sorted by customer, project, and action. It can run cross-platform and cross-network thanks to the web browser based interface, we can install it as a web service and use in any place with a network connection. Kimai offers different functions for multiple users – a customer, a worker and an admin. Besides, everyone has an access to customizable invoices and extensions that add additional functionalities. For a free open-source time tracker, Kimai is actually quite advanced and definitely worth recommending. See the differences between Kimai and TimeCamp! 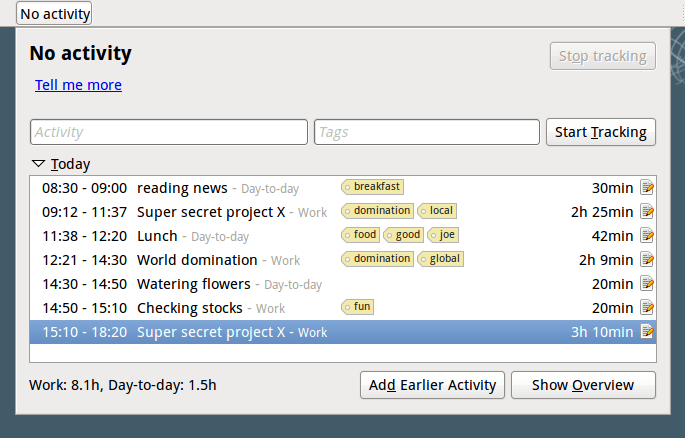 This is another simple, open source software for personal tracking and managing to-do lists. Its main job is to deal with composite tasks. Also, it offers categories, notes, and effort tracking. The word is in Czech and means “manual work”. 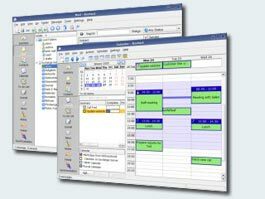 Rachota is a Java application designed for personal time tracking. It offers customized reports and invoices as well as the analysis of measured data after which it provides a user with hints how to improve the time usage. Another web-based project management application available for many users and in many languages. 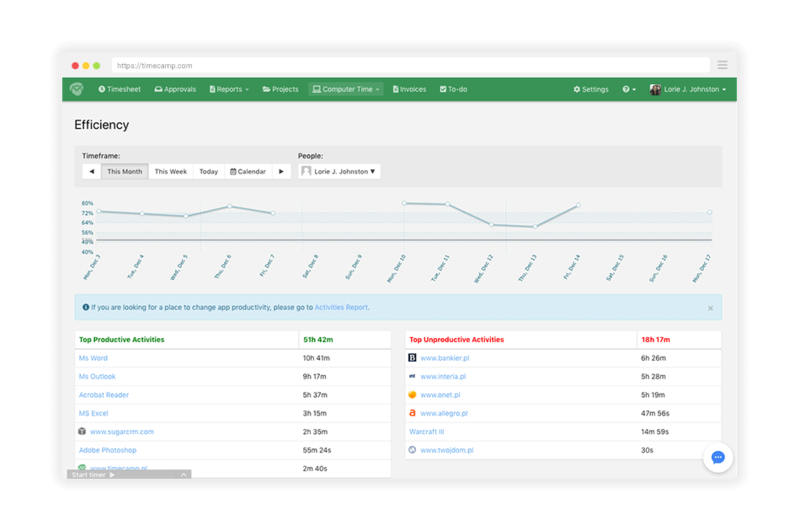 Instead of being a time tracker, dotProject is designed to be a generic project management tool. This written in PHP software is intended to serve as an information gathering and progress reporting tool. dotProject was awarded SourceForge.net’s Project of the Month, April 2009. Kontact is the integrated Personal Information Manager of KDE, but can be used with other systems as well. It supports email, address books, calendars, tasks, news feeds and much more. It lets us handle email, agenda, contacts and other ‘personal’ data together in one place. Kontakt is delivering innovations to help us manage our communications more easily, organize our work faster and work together more closely, resulting in more productivity and efficiency in digital collaboration. Kontakt consists of many components which are tailored to work well with each other. and each of them offers a different set of features. It takes some time to get familiarized with all of them, for more information we recommend visiting their website. TimeSlotTracker is a time tracking tool written in Java. Users can split it into tasks (with hierarchy. )They can also store several time slots, and make reports based on gathered data. 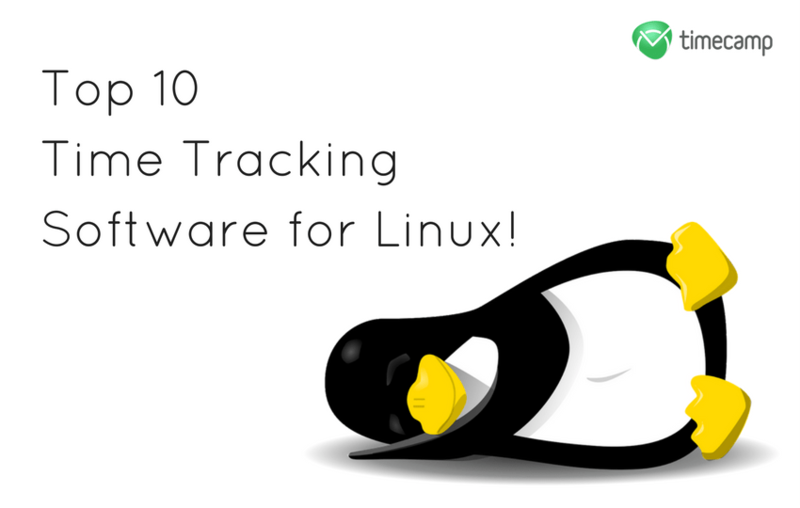 This is our list of 10 time tracking apps for Linux. Some of them may be hard to use for a person with insufficient knowledge on Linux environment. These days this is still a niche software but its value is undeniable and there is multum of reason to give it a try. Who knows, maybe one day it will go head to head with Windows and Mac OS. 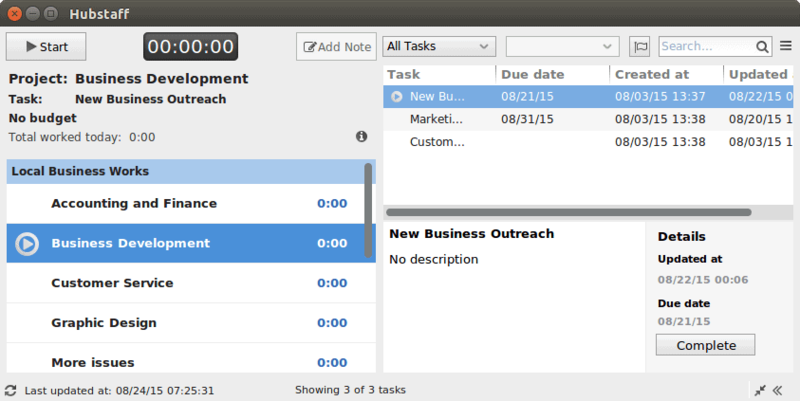 Perhaps you know some project management tools for Linux that we omitted in this article. If yes, do not hesitate to share them in the comment section! What are the Profits of Time Tracking? You did a fantastic job. Linux is not a common operating system but at the same time, it is very important for software engineers. People are facing many problems regarding time tracking in software development. Now here you define it very easily and smoothly. In my view these two “Project Hamster, Task Coach” are the best time tracking among this list. that a beginner can start with to take his/her skills to the next level? This is really a wonderful article. I would like to read more on these. Please keep posting on this. Thank-you for providing Well-researched options of Time tracking apps for Linux. As a web Developer, I have to justify the time used for designing Cratejoy Subscription websites. You made my task really simple. 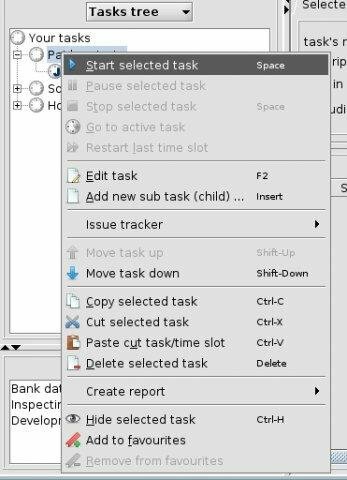 I’m a Linux user and it was hard for me to find a time tracking for this operation system. Thanks Pawel for writing this post – now there is plenty to choose from! Now I need to find some time to test them and choose the best one. GPS tracker protect the most valuable property. Anyone can track all their property in a live,map, even if the car is stolen, it is able to know the exact location and take a positive action ,alert ,notification and reports.